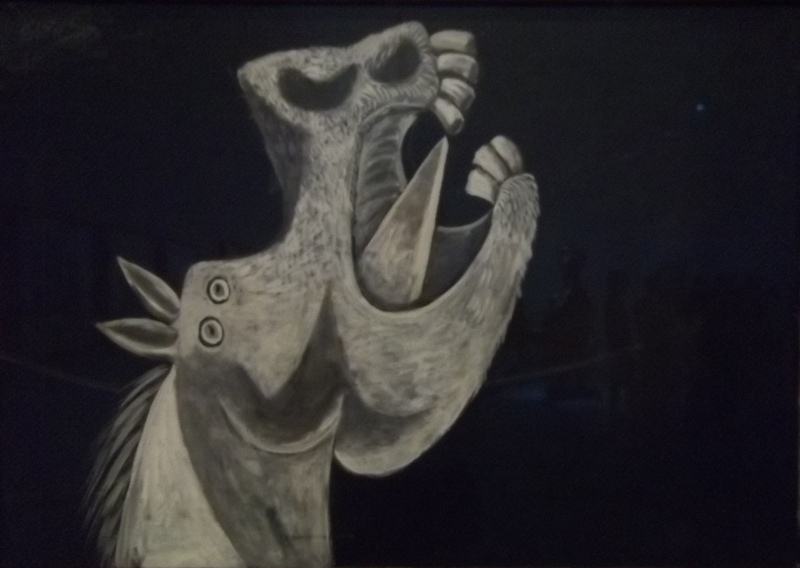 (Illustration: Pablo Picasso’s ‘Agonizing Horse,’ found here). Clear and chilly this early-evening Friday on California’s north coast, a beautiful way to end our last few days of dry — gorgeous-bright and warm this morning without much wind at all, but cooled-off by mid-afternoon with the arrival of a sharp, crisp breeze. Yet still ‘good-as-it-gets’ for around here, even for this time of the year. As it goes, this morning could have been a day in July. Rain expected tonight, with decent showers tomorrow, with maybe some hail/snow mix for tomorrow night. So far this end of the work week carries no big news-dump, though, we were treated to another presentation in our ongoing, never-ending theater of the absurd series — today’s particular performance was the nasty-arrogant, so-called testimony of Acting AG Matthew Whitaker before the House Judiciary Committee. While recapping the oversight hearing, Deadline: White House host Nicolle Wallace turned to Frank Figliuzzi, a former FBI assistant director for counterintelligence, to get his take on the acting attorney general’s performance. Figliuzzi almost immediately charged that the nation’s top cop was less cooperative than some terrorists he dealt with while working at the Federal Bureau of Investigations. “I’m not kidding when I say I have interviewed terrorists who are more cooperative and respectful than Matt Whitaker was today,” Figliuzzi deadpanned while Wallace broke out in laughter. Figliuzzi went on to argue that Congress represents the American people and, thus, Whitaker’s behavior demonstrated “utter disdain” for the public. “This is basically thumbing your nose at oversight by the people,” the MSNBC analyst declared. And he alienated everyone by getting snotty right off the bat with chairman Jerrold Nadler of New York. sniping that Nadler’s allotted five minutes were up. Bald, nasty, and stupid is no way to go through life, son. Yes, he ducked and dodged. Yes, he obfuscated and deflected. He refused to say one way or the other if the Mueller probe was a witch hunt. But he was so everlastingly bad at it that he made himself appear more unlikable than dishonest, which is a helluva trick, given that nothing he condescended to say about his relationship with the president* made any sense at all. And Jamie Raskin of Maryland pretty much ridiculed Whitaker’s entire career, getting all the way up Whitaker’s nose until Whitaker finally accused Raskin of challenging his character. At which point, Collins erupted again and we were treated to Masterpiece Parliamentary Theater one more time. They have to get better front men if this con is going to survive. A telling-tell of how horribly-incompetent, and way-petty the entire T-Rump universe/operation came when Rep. Pramila Jayapal (D-WA) asked Whitaker about those thousands of migrant children separated from their families as part of Justice Department stratagem. He was Jeff’s chief of staff when that policy was implemented last spring. While it’s true that there is no DOJ document called “family separation policy,” there was a formal “zero tolerance” policy, which resulted in parents being prosecuted for illegal entry and their kids being taken away. Sen. Jeff Merkley (D-OR) recently released an internal government memo indicating that officials were aware the zero-tolerance policy would result in families being separated. “So as the chief of staff, you were not aware of what your boss was doing?” she asked. Whitaker didn’t have a response. Acting Attorney General Matthew Whitaker said it was “deeply concerning” to him how CNN was present during a raid on the home of political operative Roger Stone. “It was deeply concerning to me as to how CNN found out about that,” Whitaker stated during an oversight hearing to the House Judiciary Committee on Friday morning. CNN’s justice correspondent Evan Perez responded to Whitaker on “CNN Newsroom” on Friday morning. “He knows exactly what’s happening here,” Perez said. Whitaker did not share if the Department of Justice (DOJ) has proof that CNN was told about the Stone raid in advance. “I’m confused. I really am. We’re all trying to figure out, who are you? Where did you come from?” Jeffries, a member of Democratic House leadership seen as a possible future Speaker, asked Whitaker during the House Judiciary Committee hearing. “And how the heck did you become the head of the Department of Justice?” Jeffries stated. “I assume you know the difference,” he said.